In the fall of 1995, four folk studies students from the Cultural Conservation class at WKU conducted an oral history project to document African American heritage in Caldwell, Christian, Todd, and Trigg counties. With grant-based funding from the Pennyrile Area Development District (PADD), local committees were established in each county, allowing interviewers to become better acquainted with long-time residents and their personal narratives, which focused on their experiences of living in Trigg County. The student group recorded a total of 18 interviews with 15 participants, most of whom have longstanding familial ties to the region. The interviews, which often take the format of a “life history,” cover a broad range of topics from American Bandstand, sorority life, courtship customs, and bootlegging, to tobacco harvesting, family reunions, quilting bees, and church services. The scope of the project, spanning nearly five decades from the early 1900s to the late 1950s, marks an era of both agricultural and industrial growth, political uncertainty, and technological advancement—all nipping at the heels of the stirring civil rights movement. 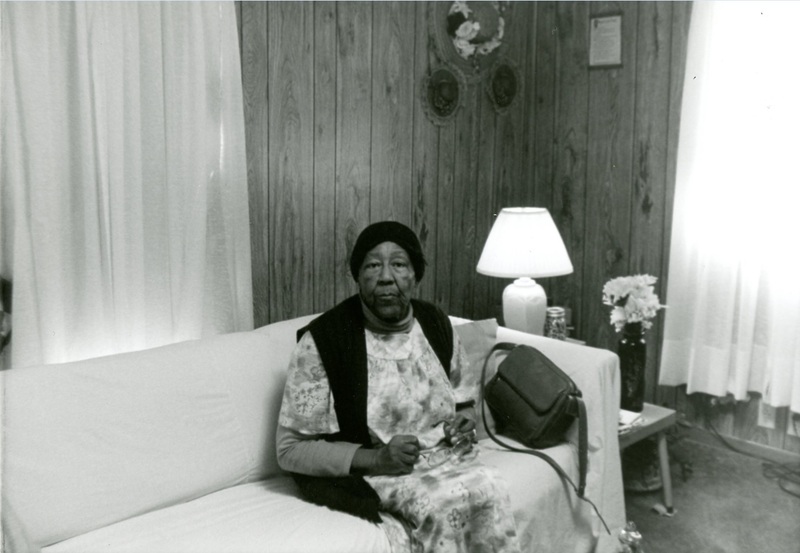 Serving as the first oral history project of its kind in Trigg County, the lives of its participants are played out on tape in ways that reveal what it meant to be black in the Jim Crow South, how physical landscapes shape cultural traditions, and how a strong sense of identity was—and remains—crucial in developing supportive, lasting communities. The collection itself (FA 196), located within WKU’s Manuscripts and Folklife Archives, contains photographs of participants, brief biographical sketches, original interview cassette tapes, and detailed indexes of every recorded interview. For information on African American experiences in Kentucky, Trigg County, and additional oral history projects, visit TopSCHOLAR or browse through KenCat, a searchable database featuring manuscripts, photographs and other non-book objects housed in the Department of Library Special Collections! The Department of Library Special Collections recently purchased a rare collection (Small Collection 3093) of documents related to the operation of the Western Lunatic Asylum (now Western State Hospital) in the mid- to late-nineteenth century. The sixty-five items in the grouping includes contracts for food, coal and linens, as well as contracts for building projects, inventories, and several fascinating documents related to a devastating 1860 fire. 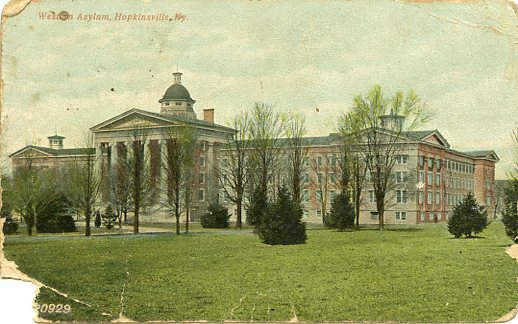 Western Lunatic Asylum in Hopkinsville. major Greek Revival building on the Hopkinsville campus. Master builders Samuel L. Slater and John Orr carried out Kelly’s design, and the institution opened on 18 September 1854 with twenty-nine patients. A chimney fire ignited the wood shingle roof, and the facility’s chief building burned on 30 November 1860. The staff helped find housing for the patients in the Christian County courthouse, a hotel, and private homes, while twenty-three log cabins were constructed on the grounds. Reconstruction took six years at a cost of $258,900. 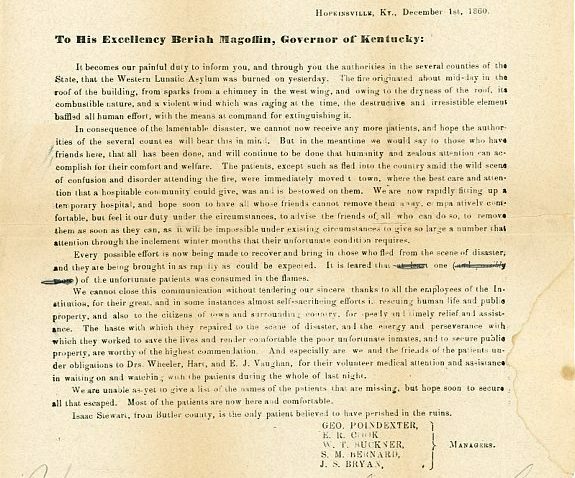 Broadside issued by the Asylum’s managers to Governor Beriah Magoffin. feared,” they added, “that one of the unfortunate patients (later identified as Isaac Stewart of Butler County) was consumed in the flames.” The managers extolled the “self-sacrificing” tasks performed by the staff in saving the patients. A good portion of the collection includes contracts and other data related to the reconstruction project, such as an agreement made between the institution and Samuel L. Slater under which the aforesaid agreed to perform “all the carpenters and joiners work, to complete the west front and western return wings of the Western Lunatic Asylum building” which included “all flooring, doors, door frames, window sash, casings [and]…mouldings.” For his work, Slater would receive $4,050. For more information about this new collection, see the finding aid by clicking here. To see other manuscript finding aids, search TopSCHOLAR. Dr. Wilson’s field glasses and some of his bird checklists. “Tiny Treasures,” curated by Special Collections Cataloger, Joseph Shankweiler, contains several pieces related to Dr. Gordon Wilson, former professor and head of WKU’s English Department as well as avid bird watcher. 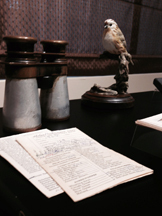 The exhibition features miniature books from the Department of Library Special Collections (DLSC), and one case highlights several bird identification guide books. To enhance the case, the curator chose a pair of field glasses (loaned by the Kentucky Museum) that Gordon Wilson used on his well-known bird watching expeditions. 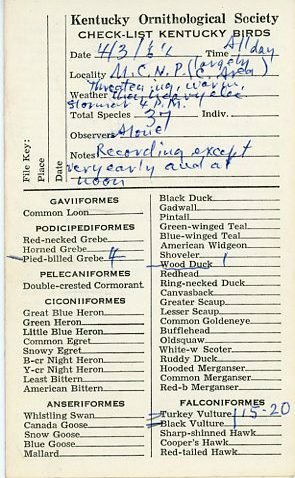 Also included in the case are several bird checklist cards, produced by the Kentucky Ornithological Society, on which birders could mark the specific birds they spotted on individual treks. These two small cards, from a collection of close to 1000 similar cards in Dr. Wilson’s papers, document a trip taken in 1964 to Mammoth Cave National Park. Alexander Gordon Wilson was born on 14 October 1888 in New Concord (Calloway County), Kentucky. He attended local public schools and Clinton College and afterwards taught in the rural schools of Hickman County. He entered the Western Kentucky State Normal School, now Western Kentucky University (WKU), Bowling Green, Kentucky, in January 1908 and received a life teaching certificate in 1913. He then matriculated at Indiana University, where he received his bachelor’s degree in 1915, a master’s degree in 1924 and a Ph.D. in 1930. The two later degrees he earned while teaching at WKU. Wilson became an English instructor in 1915; he was formally appointed department head in 1928 and held that position until his retirement in 1959. Besides teaching the classics, Wilson was nationally recognized as a folklore expert. A finding aid to Dr. Wilson’s collection can be found by clicking here. A typical bird checklist from the Wilson Papers. Wilson was an accomplished amateur ornithologist. He began observing birds around 1909 and recording information about his nature walks and sightings while he was at Indiana University. Upon returning to Bowling Green, he became more serious about the avocation and published his first major article on birds in The Auk (1921). His fieldwork concentrated on south central Kentucky and he published several articles and pamphlets about the area’s birds. Wanting to share his information with fellow enthusiasts, Wilson helped found the Kentucky Ornithological Society in 1923 and edited its publication, The Kentucky Warbler, for a number of years. In recent years, DLSC, in cooperation with the Kentucky Ornithological Society, has digitized copies of The Kentucky Warbler. They can be accessed by clicking here. “Tiny Treasures” will be on exhibit through December 8, 2016, in the Kentucky Building’s Jackson Gallery. Library Special Collections has created a new website where our users can give us feedback on the cool things they are finding in our collections. All our units acquire and preserve materials primarily related to Kentucky and Kentuckians. Here it may be possible for you to find your ancestors’ marriage record, family and community photographs, oral histories and everything you ever wanted to know about Western Kentucky University. Come visit us in the Kentucky Building, Monday – Friday 9 – 4 and Saturdays during the semester 10 – 3. And tell us what you discover or have already discovered here. WKU is known for ghosts and those who hunt them. The Folklife Archives houses many collected stories and legends about ghosts and other kinds of monsters, start with Supernatural Experiences. WKU Libraries has many books related to the supernatural as well. Ghosts have been known to appear in the Kentucky Library collections. 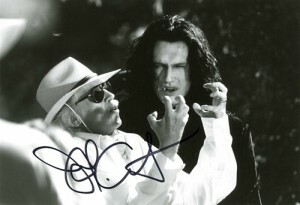 WKU Archives contains images and writings of John Carpenter, a local boy whose name has become synonymous with Halloween. View a Kentucky Museum Pecha Kucha talk about the origins of Halloween. Resources rounded up by WKU Archives Assistant April McCauley. For over 20 years the mission of the Kentucky Folklife Program (KFP) has been to responsibly engage with Kentucky communities to document, present and conserve the cultural heritage of the state, most often referred to as folklife. In keeping with this mission, the public folklorists working for the KFP in the field over these years (and into the present) have documented and shared the diverse and dynamic folklife of communities across the Commonwealth who so graciously allowed them entry into their lives. Last summer the KFP was relocated to Western Kentucky University from its former home in Frankfort, and with it came its archive, a vast repository of images, recorded interviews, and field notes that collectively tell the unfolding story of Kentucky and its people. The images that make up this exhibit were chosen from the KFP archive by Kentucky Museum staff and encompass a board overview of its rich contents. Click here to view directions and hours of operation for the Kentucky Museum. The KFP archives is administered by the Manuscripts & Folklife Archives unit of the Special Collections Library. Faculty and staff are excited about adding this extensive resource to our research collections. To view finding aids for collections in WKU’s Folklife Archives click here. Recently Carol Medlicott, professor of cultural and historical geography at Northern Kentucky University, published an article about music in the western Shaker communities titled “Let’s mingle our feelings”: Gender and Collectivity in the Music of the Shaker West” in Common-Place, vol. 13, no. 3 (Winter 2013). 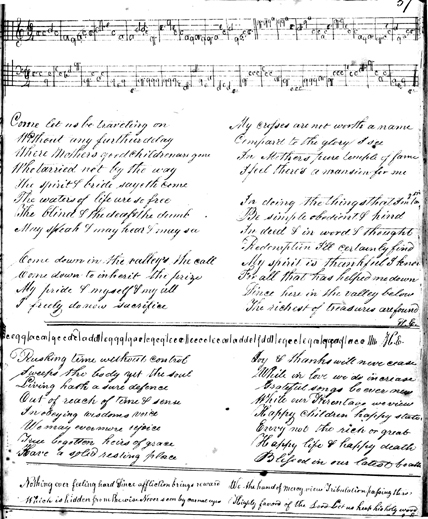 In the article she features photographs of manuscript music from several Shaker hymnals housed in the Manuscripts & Folklife Archives unit of the Special Collections Library. Her article is partially the result of research performed at the Special Collections Library as a Research Fellow several years ago. Medlicott’s journal article is available online by clicking here. Over the past eight decades, the Special Collections Library has become one of the premier research libraries for researching the Shakers or the United Society of Believers in Christ’s Second Appearing. One reason for this niche collecting area is the library’s proximity to the Shaker village at South Union and the location of another Shaker village in the Commonwealth at Pleasant Hill. Many printed and manuscript items about Shakers, and particularly South Union, are found in the Special Collections Library. Examples of Shaker furniture, textiles, and other artifacts are housed in the Kentucky Museum. Another reason for this outstanding collection was the tireless efforts of former Kentucky Libray & Museum director and Shaker expert, Mary Julia Neal, to add relevant Shaker and other utopian studies materials to the library. To see the finding aid of Miss Neal’s own manuscript collection, click here. To locate finding aids for other Shaker research collections in Manuscripts & Folklife Archives search TopSCHOLAR and KenCat. Stock certificates often provide interesting information about a generation’s cultural and financial history. 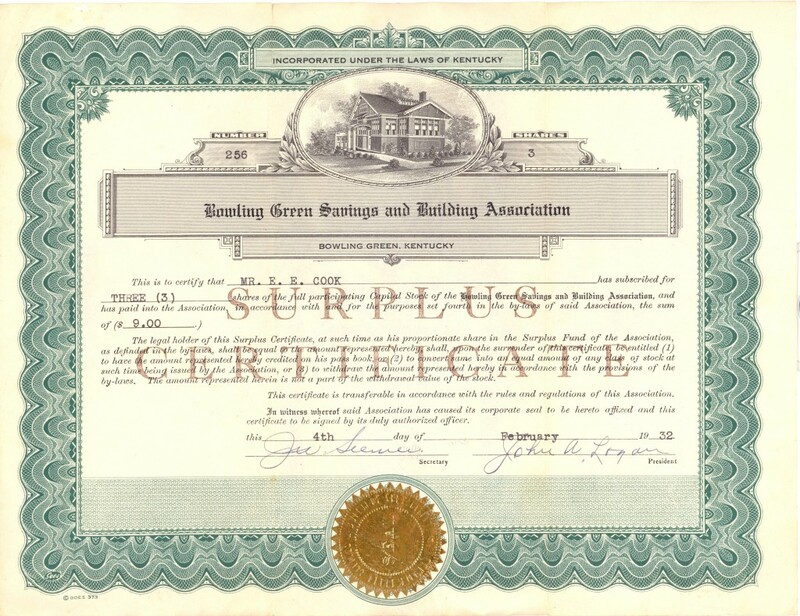 This certifcate for the Bowling Green Savings and Building Association was recently added to the Manuscripts collections in WKU’s Special Collection Library. The 1932 certificate documents the establishment of an independent savings and loan assocation which was funded solely through local stock purchases. The proceeds were used to make loans for local home and land purchases. The Association sold $750,000 worth of $3 shares within six months. The business, ran by John A. Logan, operated until he began to experience poor health in the mid-1940s. Logan owned extensive land holdings in the Smiths Grove area. He also worked as an attorney for the Kentucky Rock Asphalt Company in Edmonson County and served as president of Smiths Grove Deposit Bank. The Bowling Green Savings and Building Association was founded to invest local funds in local financing. This was a real boon to people who experienced difficulty borrowing from faltering, or heavily regulated, banks at the time. This certificate indicates that Elbert Eugene Cook purchased three shares of capital stock in the Association for three dollars per share. Click here to see a finding aid for this small collection. Comments Off on Invest Locally!